On Thursday, Breitbart.com reported that a mob of anti-Trump protesters defaced one of New Orleans’ most famous monuments with a violent racist slur against white people. 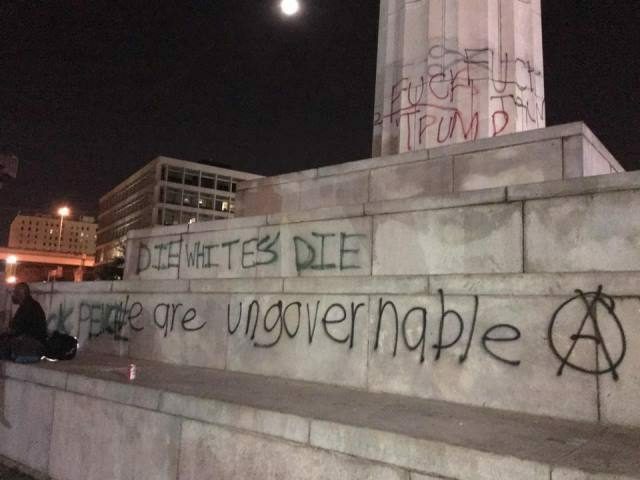 “Die whites die” and “F**k Trump” were just two of the violent messages painted on the monument. Unbelievably, some on Twitter actually thought this was fake because in their view, blacks don’t use that kind of language. Never mind the video evidence. Of course, the report doesn’t specifically say that “blacks” vandalized the monument, something critics would know if they bothered to actually read the article. Right. It’s a “setup.” Naturally, someone infiltrated a protest just to paint this message to make others look bad. Democrats, get a grip on your party. Repudiate rioters chanting "die whites die" or make your new slogan "the party of reverse racism." Of course, it’s not known who, exactly, did this, but one thing is certain — whoever did it, regardless of skin color, should face the full penalty of the law. But who am I kidding? After all, Hillary Clinton put our national security at risk and didn’t even get a slap on the wrist.